This story was a collaboration with WBEZ and their project, Heat of the Moment: Everyday Life on a Changing Planet. You can see more photos from Nahant here. Nahant, Massachusetts is a rocky crescent moon-shaped piece of land that juts out into the Atlantic Ocean just north of Boston. For its entire history, it’s been at the mercy of the ocean. 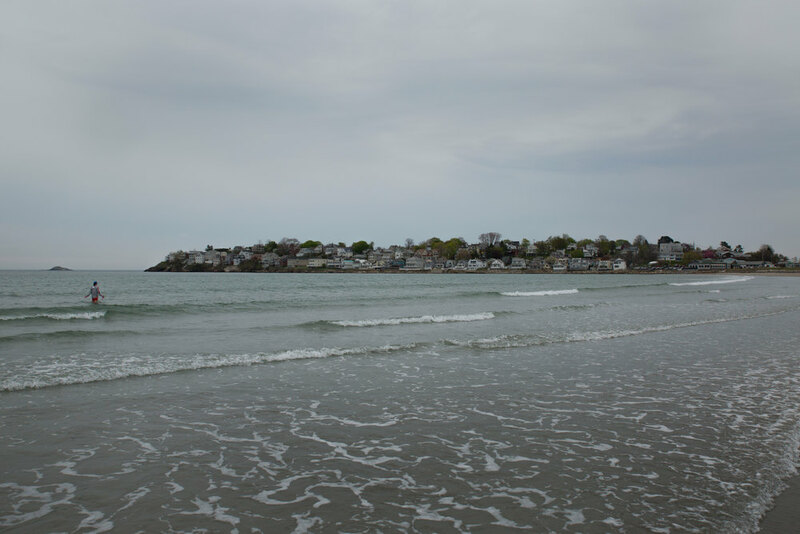 To get to the town, back in the 1800s, you would cross a long beautiful beach at low tide that connected Nahant to the mainland. At high-tide, you had to take a boat. These days there’s a four-lane road built on that beach, and it sits just a few feet above high tide. “When the weather’s good in the summer, there’s no prettier, nicer place. We have a private beach, we have a great view. The shipping lanes of Boston come right in front of our house, so all the big ships that come in we can see. And I love it, I love my house,” said Dave Lazzaro, a retired bartender and a wood worker, as he sat in his living room on a windy spring day. The house he shares with his wife Chris is filled with his carvings -- it’s kind of a comforting nautical clutter. They have lived on Willow Road, in a house that at high tide is a stone’s throw from the water, for nearly 50 years. “I raised a family here,” he said, matter-of-factly. Waterfront property tends to be expensive. More than 120 million people live in coastal counties in the United States -- that’s more than a third of the country. But most people living by the water know -- you get the beautiful summer days, but also the brutal storms. There are two storms that people who have lived in Nahant for a long time talk about: the Blizzard of 1978, and what everyone here calls the “No-Name Storm” in 1991. If you live anywhere else, you’ve probably heard that second one called the Perfect Storm… they made a movie about it. As the seas rise, climate scientists predict devastation will become more and more common. Higher seas mean even a less powerful storm could push the tides up over Nahant’s seawalls. Around the country, as many as 12 million people could be at risk because of sea level rise. Fortify, accommodate, relocate. In other words, you can brace for things getting worse, you can try to adapt to live with the occasional flood, or you abandon your home and flee. If this sounds like a simple choice, spend some time in a place like Nahant, where people are facing these choices. When you do, it’s gets clearer that each of those options is a lot more complicated. Let’s start with fortify-- choosing to stay and fight. In Nahant you can see this just a few doors down from Dave Lazzaro, in Ken Carangelo’s house. He’s single, no kids, and is an executive at a big company in the film industry. 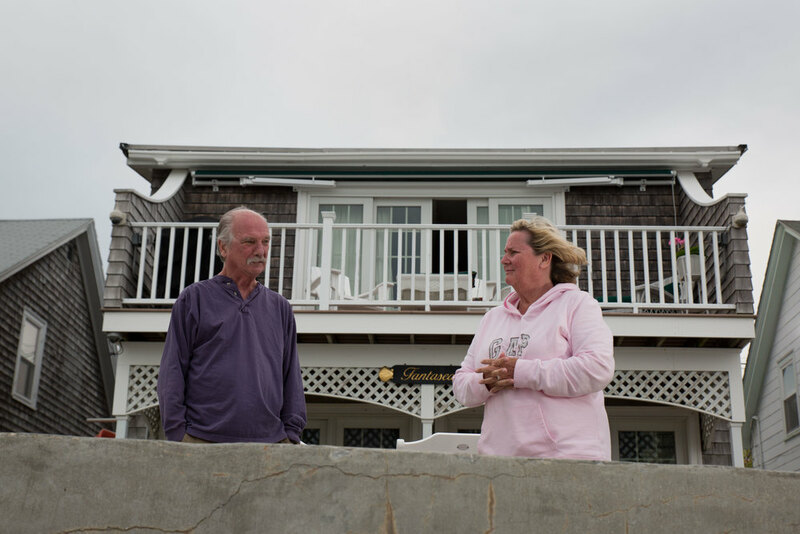 He and his neighbors each own a section of an interlocking seawall. Carangelo’s house was built in the ‘90s after the Perfect Storm undermined the old wall. It’s pretty imposing: tall enough that you can’t reach to the top of it from the beach, and even more concrete is buried under the sand. “And everything that’s down there has a solid footing and kevlar-coated rebar, so the salt doesn’t get to it as much,” Carangelo explained. Plenty of people in coastal communities believe the federal government should help pay to protect these sandcastles, and that’s true in Nahant too; one local official told me he thinks the Army Corps of Engineers should put a breakwater in Nahant Harbor. But Sam Merrill, the coastal engineer, says the cost of protection -- especially if you’re trying to protect every building, from every storm, in every community in the country -- could run into the billions every year for a century. “I don’t think it’s feasible to protect every community,” he said. So how about accommodating? That second option on our list means trying to live with flooding and find ways to let the water flow in and out without causing too much damage. In Nahant, they’re trying that too. Enzo Barile, a local elected official, gave me a tour, pointing out newer houses that have been built to withstand moderate flooding. “Seawalls can only do so much. You’re not going to stop the Atlantic Ocean,” he said. 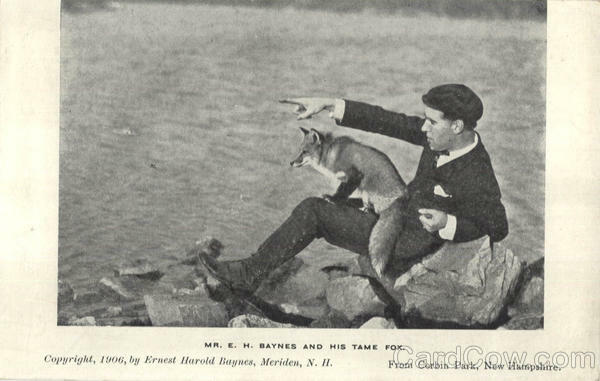 Barile grew up in Nahant. 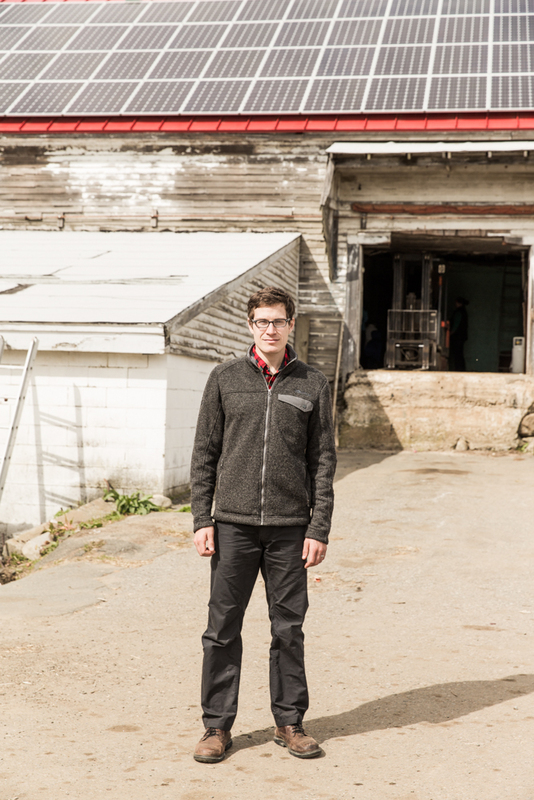 He owns a garage in town and can point out where all the families of mobsters used to live. 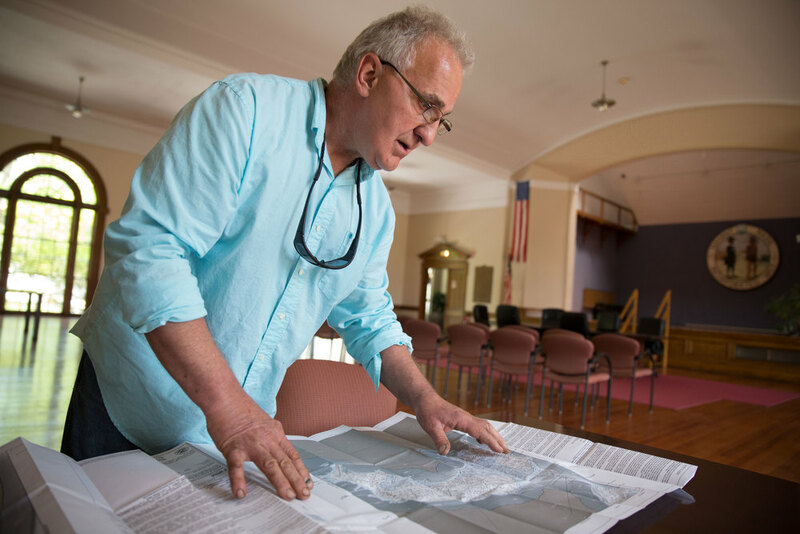 He says the biggest accommodation Nahant has made is keeping a lot of its low-lying areas out of development. There’s a baseball field, a golf course, and a small bird sanctuary all built into some of the lowest areas of the town. And there’s even a pond at the low-point of the town’s golf course, and when storms come they put giant bilge pumps in to drain the town, and make room for the water that’s on its way. “So we actually drain the town down, before we know there’s a major event gonna come, north’easter… we drain it right down,” said Barile. But despite the seawalls, and the open space, Nahant has some of the worst flooding in Massachusetts. There are only two towns in the state that have received more per capita in federal flood insurance claims. What’s more, nearly 50 homes in Nahant are places called “repetitive loss properties.” These are buildings that have had more than two major flood insurance claims in the past 10 years -- kind of the definition of having your home in a risky spot. These homes make up something like one percent of all the buildings covered by the flood insurance administered by the Federal Emergency Management Agency (FEMA), but that one percent accounts for nearly 40 percent of the claims. Even Enzo Barile -- a lifelong Nahanter -- thinks there’s a point after which you shouldn’t get paid to rebuild a home in a spot like this. This brings us to relocation -- just move. That third option on our list -- maybe more than the others -- seems so simple as a hypothetical. But in real life, it’s not even close. Consider Dave Lazzaro, the retired bartender who likes watching the ships go by. His home on Willow Road has been flooded six times over the past 40-some years. He doesn’t question that the seas are rising. “Storms are getting more intense and there are places where once you can live, that now you can’t live. I don’t think of Willow Road that way,” he said. And that’s the thing; Nobody thinks this way about their own home. Even if logically they know the odds… which Dave does. When you’re talking about other people’s houses by the sea, and how risky those are, it’s much easier to distance yourself and look at the facts. When it’s your home, the view gets blurrier. This is where flood insurance comes in. The price that people pay should be an indicator -- a clue -- that sooner rather than later, you will be in trouble. Even in one household, figuring out where and when to draw the line is complicated, and the signal of risk that flood insurance sends gets all mixed up in your love for your home. And that risk signal gets more muddled when federal flood insurance subsidies don’t reflect the true risk of living in the sorts of flood zones. Members of Congress like then-Louisiana Sen. Mary Landrieu, fought in 2013 to keep the subsidies. “This is a major bill that passed without the data necessary to use either compassion or common sense,” she railed in a committee hearing at the time. Less than two years after the change was passed, Congress watered it down: delaying some rate increases, and eliminating others. This means, while insurance rates are rising for coastal residents, it could take another ten to fifteen years before many of them are paying what the private industry would consider a rate that truly reflects their risk. So there is no clear message telling coastal homeowners whether they should relocate, at least not through the rates. Sam Merrill, the coastal engineer with GEI consulting, thinks that without some sort of action, eventually many homeowners will be left holding the bag when their homes simply cease to be worth anything... or their homes are swept away. We often look for the easy -- least painful -- answers. But when it comes to sea level rise in communities that could be facing extinction, there may not be a solution that makes it so no one gets hurt. Sam Evans-Brown and Logan Shannon, with help from Maureen McMurray, Taylor Quimby, Molly Donahue, and Jimmy Gutierrez. We produced this episode in collaboration with the Heat of the Moment, which is a project of WBEZ in Chicago. Flood insurance is a complicated topic, so special thanks this week to Dave Conrad, Steve Ellis, Howard Kunreuther and Carolyn Kousky who cumulatively spent hours explaining all of the nooks and crannies of the issue to me. If you’ve heard of net metering, I challenge you to come up with a definition of what it is in the next 15 seconds; I bet you can’t. And yet, this indecipherable term has been the center of some of the most heated energy battles of recent years. California, Nevada, Iowa, Texas, Maine, Vermont, New York, Utah, Hawaii, and Massachusetts have all struggled with it. The fight over net metering in Nevada even attracted the attention of both of the main Democratic presidential hopefuls, Bernie Sanders and Hillary Clinton. This battle is happening all over the country, state-by-state, and each fight has its own local flavor when it comes to this argument. But what the heck is net metering? Why are we so worked up about something that, on its face, looks to be nothing more than a simple billing mechanism? And this is the question that gets me interested: Where the heck did this fight come from? The answer to this last question is that net metering is something of a historical accident, born at the cross-roads of necessity and ingenuity, but without much forethought. So read on, this is the accidental history of net metering. Like me, Steven Strong is an energy nerd. Unlike me, he’s also a talented engineer and innovator. He’s a guy who, when Toyota came out with the Prius got to work hacking the thing, installing a lithium-ion battery back and turning it into a plug-in electric car, years before the car company was ready to do the same thing. Steven got his start as a young engineer working on the Trans-Alaska Oil Pipeline in the years of the Carter administration, but then there was the whole Arab oil embargo, there was a scandal where contractors were falsifying some of the required safety measures on the pipeline, and so he resigned and returned to Boston to become and architect and found his own solar design company. This was in the early seventies, when solar power, besides being on satellites in outer space, wasn’t really a thing, yet. But Steven did manage to get work. In particular, he landed the contract to put a solar array, one of the first of its kind, onto a 286-unit, federally-subsidized, low-income housing complex. The building looks kind of like a big college dorm: it’s brick, and it’s pretty unremarkable looking. aN EARLY PHOTO OF THE BUILDING, SOLAR PANELS STILL INTACT. At this time, commercially available solar power was used to heat hot water. (To oversimplify, the systems were basically rows of pipes, painted black, that allowed the sun’s rays to heat up the water inside.) The solar system he installed was one of the largest solar thermal systems in New England, and he estimates it met something like 80% of the building’s annual hot water requirements. But back in the seventies, solar photovoltaic, which is what you’re probably thinking about when I say solar panels, was something like 65 times more expensive than it is today, and electricity was cheap. But Steven Strong, who always wanted to push the envelope, convinced the developer of this building to let him install a couple of photovoltaic panels up there too. But there was this question: how do you wire them up? Whenever the sun is shining, obviously the electricity from the panels would go towards running all the stuff—water pump, hot water heaters, lights and fridges—in the building. 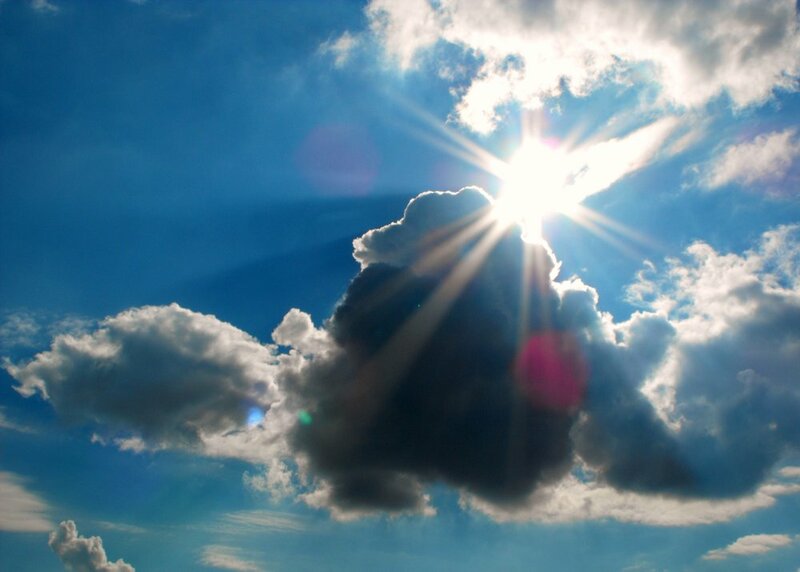 But then what happens when the sun’s not shining? Or what happens if the sun is shining and there’s nothing going on in the building? Today we take the answer to these questions for granted. We assume that when you’re not using it, the extra energy can just feed out into the grid, but when Steve Strong was wiring up this building, that was not a given. He decided to configure the system so when there’s no sun, the building would buy electricity just like any other building, and the little dials on the electric meter would roll in one direction. But if the sun was shining, and the appliances in the building weren’t using any energy, the electricity would flow out onto the grid, and the little dials on the meter would just roll in the other direction…backwards. “It was intuitive, and it was almost just like, that’s just the way it should be. We’re producing electrons that are just as valuable as the ones delivered by the coal plant or the heavy residual fuel oil driven plant, and so it just made sense,” Steven told me. He didn’t ask for permission from the utility to feed electricity back into the grid. He didn’t show them a design and say here’s what I’d like to do. The developers told him they would handle all of that. Instead of asking permission, they had a big ribbon cutting ceremony. They invited the head of the national renewable energy lab, all the senators and congresspeople from Massachusetts, and even President Carter. The President was planning on coming, but they put the kibosh on his appearance at the last minute because there was a strike at a nearby shipyard and the Secret Service told him to stay away. And at this event, a torrent of important people stood up and spoke about how great the building was, how forward thinking it was, and how it would be the way of the future. Then, the last person to talk was an executive from the utility. And that, ladies and gentleman, was the birth of a little policy called net metering. That is also what the name means: when you’re producing, the meter runs in one direction and when you’re consuming, the meter runs in the other direction, so the practice is called “net metering” because you’re billed for your net consumption. Those first grid-integrated solar photovoltaic panels didn’t last particularly long. They were blown off the roof of the building after little more than a year, according to the building’s manager George Picewick. The solar thermal panels heated the building’s water for more than 20 years, though, before they had to be removed because of a lack of maintenance. And for Steven Strong, this project kicked off years of work on net metered buildings that catapulted his work into the spotlight. Very shortly afterwards, MIT came calling. They asked Steven to help them build a house that would be “energy independent,” by which they meant that it would generate as much energy as it used, even though it still relied on the grid. Today such a house is called a “net-zero” home. This house was built in Carlisle, Massachusetts and was on the cover of magazines like Popular Science, and written about in publications worldwide. The cover of Popular Science from September of 1981 features the Impact 2000 house. 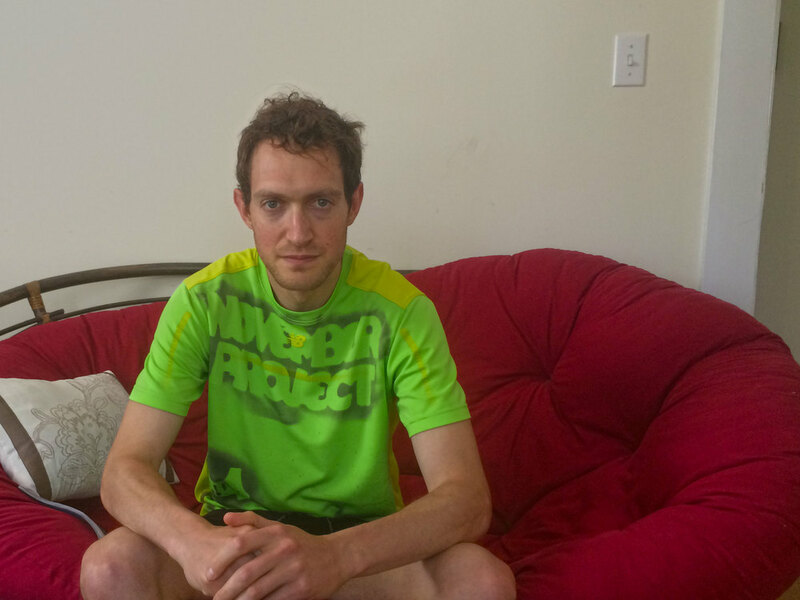 Because of all this attention, a local utility, Boston Edison, reached out to Steven Strong. They wanted to build a net-zero house too, and they called it the Impact 2000 House. This house was super-insulated, all electric (heated by a geothermal heat-pump), and all bedecked with solar panels. It was also a public relations coup for the utility, which had been beset by protests focused on its new nuclear power plant. Steven Strong was also contacted by the producers of This Old House who decided to do the entire fifth season of the show about the construction of the Impact 2000 house. After that house, another utility asked Steven Strong to do a whole neighborhood of net metered solar homes, and the story of this weird billing trick just expanded from there. Before long Massachusetts regulators officially put a rule about net metering on the books, and other states followed suit, some even passed laws that formally established the practice. Now it’s allowed in 41 states, plus Washington, DC. And for years not only was it totally non-controversial: solar power was seen as something that a few tech enthusiasts and environmental zealots would do, but certainly it wasn’t expected to spread to the masses. In hindsight this seems short-sighted, that a policy with the potential to shape the future of something as important as the electric grid would be allowed to grow so organically and without any real vetting or thought. It was just a historical accident, that just sort of happened, kind of under the radar. Until, suddenly, solar started to get cheap. In 1980, a solar cell cost $30 a watt. Today, it’s more like 30 cents a watt. And starting in the mid-2000s, a bunch of really ambitious and well-financed companies started saying, Hey… we can make some money doing this. So from 2009 to 2010, the amount of solar in the US doubled. It doubled again from 2010 to 2011. It doubled again from 2011 to 2013 and from 2013 to today it’s on track to triple… again. And some of this rapid growth came not just from large-scale solar farms (though much of it is that), but from people putting panels on their roofs, and reducing—and sometimes eliminating—their electric bills. That was made possible by net metering, and I think it's fair to say that back in the seventies, the electric companies did not see this coming. And now they’re starting to push back. Which brings us to the litany of states where net metering became an intense and public energy policy debate that started us off in this story. And why is it such a fight? Well, it all has to do with how we pay for electricity. The utilities argue that net metered customers are using the grid to power their homes at night or on cloudy days, but they aren’t paying for the grid. This then means there is a smaller pool of people paying for the grid, and that smaller pool has to pay more. Those who are sympathetic to this argument sometimes describe it as wealth redistribution. This (in very rough terms) is how utility rate structures work: a utility is a big company that invests a ton of money in poles and wires, and they also pay for energy to send across those poles and wires. Then, they take all of their customers and they divide the cost of all of those expenses up between all of them and they spread it around, charging different kinds of customers slightly different kinds of rates based on how they use electricity. It has basically been like that since the first electric meter was invented: back when Thomas Edison built the first electric power stations, there were no meters, so he actually billed people a monthly fee based on how many lightbulbs they had. The entire business model is based on a piece of equipment that is more than 100 years old, and the utilities argue that under that business model, if 50 percent of the people in the United States went solar and started net metering, a big chunk of the money that they’re saving winds up being money that’s not going towards the poles and wires. But What if Solar is Saving us Money? Except, we’re not 100% sure that’s true. To understand this argument, you have to understand that even though on your electric bill you pay the same amount for every unit of energy, all electrons are not created equal. In reality, every five minutes there is a new auction for energy and so every five minutes we’ve got a new price for energy. When demand is low, prices are low, and they can actually go negative, usually at night. (As in power plants will pay us so they don’t have to shut down.) When demand is high prices can be insane: 100 times higher than normal. But again, the utilities take all of those costs, they average them all out, they divide them by their customers, and you never see that variation on your bill. So the thing is: if solar panels are producing at times of day that are really high value—sunny, hot, air conditioning heavy days—the electrons coming off the panels might be worth substantially more (on average) than all of the electrons on the grid (on average). And maybe, just maybe, even the very generous rate net metered customers are getting doesn’t fully reimburse them for what they’re making. There’s more to this argument. If done properly, solar might reduce the need to build new power lines, substations or other infrastructure, but most of those other facets stem from this same principal. Solar tends to produce at times when the grid is most in need of electrons. So How Can We Know Who’s Right? “These problems are often put out there as very difficult problems to solve. They’re actually not, in my view, that difficult to address, but we need to just put all of the numbers on the table.” That’s the assessment of Jessika Trancik, she’s a professor of energy studies at MIT. Jessika’s point is that we can answer this question for every individual solar array if you look at the data. When is it producing? What are the power prices at that moment? What kind of neighborhood is it in on the grid? What’s the load on that circuit? Is it helping on that circuit or is it hurting on that circuit? But in order to do this, you need the data. That means installing smart meters on solar arrays so we can see the minute-by-minute production of the panels. It means getting the data from the utilities to know if the solar panels are producing at a time when they are needed in the given neighborhood that they are in. And it could also mean paying solar producers prices that make more sense: as in prices that are different for different times of day. Here in New Hampshire, people are arguing about what to do with the state’s net metering program, and most of the fixes that people are proposing are pretty blunt instruments. In my opinion, they are kind of disappointingly blunt. If you’re a net metered customer in New Hampshire, you’re getting paid about seventeen cents per kilowatt hour. So seventeen cents is the starting point. For the Jessika Tranciks of the world, (steely energy economist academics), this is not really getting at the root problem, which is: the way we pay for electricity doesn’t reflect the way electricity is actually generated and the actual costs that are incurred. And there is one proposal on the table in New Hampshire that would start to shift that model. “It is clearly inappropriate in today’s technological age to continue to charge people the same price for electricity 24/7, when the cost of providing people electricity varies, sometimes by orders of magnitude, depending on the time of day and the time of year,” said Don Kreis, the state’s consumer advocate. Don’s job is to watch out for people who pay electric bills, he’s looking out for the little guy. Don wants solar customers to have the option to move to a Time-of-Use rate, a rate that would pay you more if your solar is cranking out electrons during high price times, like later in the afternoon. On the flip side, this rate would also mean that you pay more, if you’re using more energy in the afternoon. To make this really simple, every day there would be a higher price between 2pm and 8pm. This is cracking open the door to a totally different way of paying for energy. Instead of abiding by this crazy illusion that every electron is worth the same, it acknowledges that when demand is high, electricity gets expensive, and maybe we should let people know that. Jessika Trancik, from MIT, wants to take that concept even a step further. Remember, every five minutes, there’s a new auction and a new energy price every five minutes. She thinks we should all have a little display in our houses that says, here’s the price of energy, right now. In her mind that price could change every hour, and it could be capped, so customers are sheltered from the most extreme fluctuations of the grid. In this world, every home, not just solar homes, would be outfitted with a little display telling you what the price of electricity is at that moment. Perhaps it could be color-coded, to give you a clue about whether that price is high or low. With that information, we could all make choices about when to run our driers or our dishwashers, and maybe manufacturers would make devices that could read that display and automatically respond: flipping on in the middle of the night, say, if electricity prices drop to zero or lower. In this world, solar producers would get paid based on what the grid price is from moment to moment, and the whole question of shifting costs from rich to poor would be rendered moot. Of course, this dream relies on a lot of technology that simply has not yet been deployed, may well be very expensive, and needs to be protected from cyber-attacks… all of which are profound concerns for the utilities that are being asked to do this. But for Don Kreis, the consumer advocate, a policy like net metering—one that was created accidentally, without forethought or design, and without regard for the markets it would impact—cannot stand forever. So that’s one way the world could change. Or we could just go back to billing based on how many light bulbs you own. There’s always that. Thanks this week to Bob Johnstone, whose book Switching to Solar led me to Steven Strong, and to Haskell Werlin who rushed back from a funeral to talk solar policy with me. Music this week was from Jahzzar, Jason Leonard, Blue Dot Sessions and Podington Bear. Check out the Free Music Archive for more tracks from these artists. ...Or, How Sam Learned to Stop Worrying and Love the Cold Hardy Kiwi. 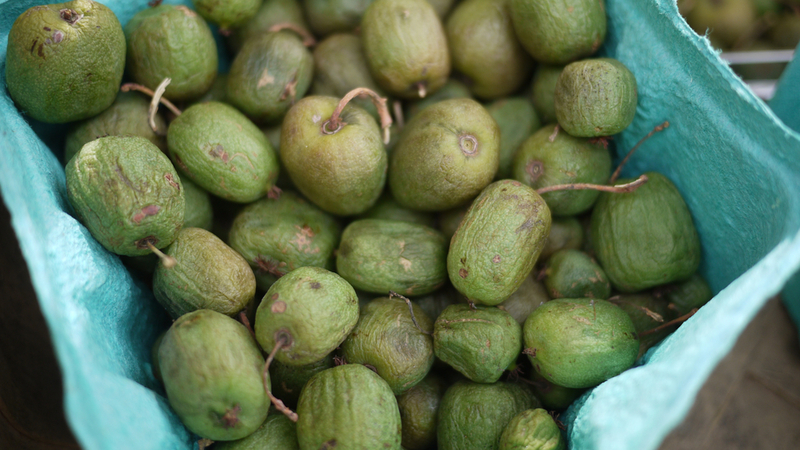 Iago Hale has a vision: it’s one where the economy of the North Country is revitalized by local farmers selling delicious cold hardy kiwi berries to the masses. Meanwhile, Tom Lautzenheiser has been battling a hardy kiwi infestation in Massachusetts for years, and is afraid that this fight will soon be coming to the rest of New England.